(Walking Track) – Starting from Arataki Visitor Centre, the track goes down a concrete path past the scenic picture frame. There is a gravel-surface short walk (slight uphill gradient) to a viewpoint of the Manukau and Waitemata Harbours. The track then descends steeply and crosses Jacobsons Depot Road. The walk continues, with scenic views, to meet Exhibition Drive at Mackies Rest. Please be aware that this track is also available for cyclists. 1.7 km 1.0 hour. (Source). 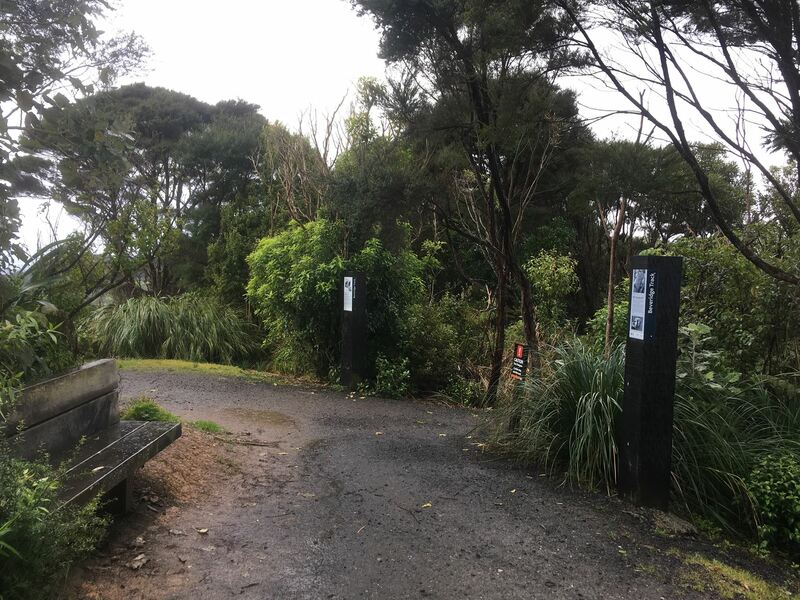 Beveridge track is named for the Beveridge family and especially honors Bill Beveridge the Chief Ranger for the Waitakere Ranges between 1970 and 1990 who co-founded the Friends of Arataki during his retirement. Bill determined and named numerous tracks in the Waitakeres and now the Beveridge name is acknowledged with it’s own track sign. Although I usually traverse this track in the opposite direction than is described on the Auckland Council website I have entered from the Arataki Visitor Center car park twice – the first time I had Miss Isabelle (8) in tow and we went as far as the Beveridge Lookout, which is approx 5 minutes from the stiles at the beginning of the gravel walk. A few weeks after that on a rainy afternoon I went straight from work and ran the Beveridge Trail and then continued onto Exhibition Drive (shown in green on the map above) at Mackies Rest. Beveridge Trail is one of the newest trails in the network and as such the surface is “just like new” after following the path the driveway from the Arataki Visitors Center (which is concrete – parts of which are slippery when wet) the trail becomes gravel. It’s wider than a single trail but not particularly wide (especially when compared to Exhibition Drive). After the Beveridge Look Out (which has a bench seat facing the coast and a picnic table tucked around the corner), the track narrows and descends quite steeply via switchbacks for approximately 200 metres then continues to descend less steeply to Jacabsons Depot Road (which is where the now defunct Rainforest Express ran). 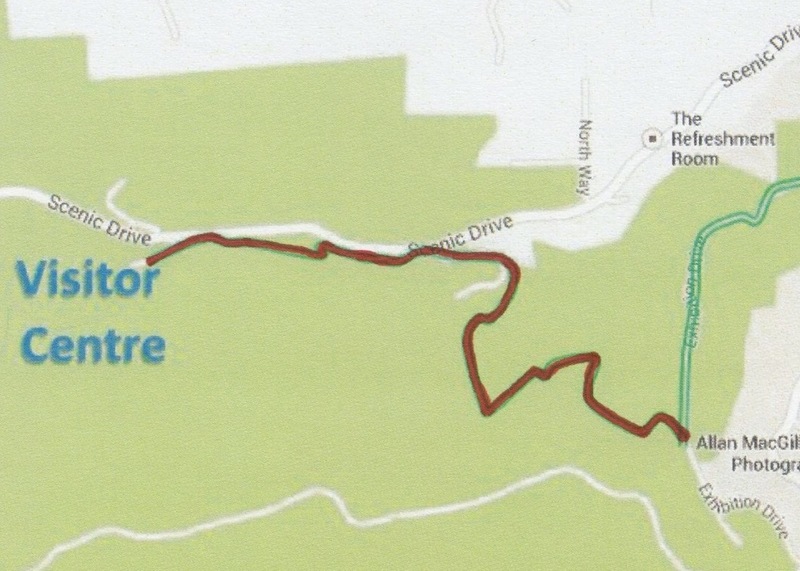 In summary, the Beveridge Track is probably too short to run on it’s own but it’s probably fine if you’re looking to walk one of the Arataki Visitor Center tracks and it’s certainly less crowded than the Nature Trail (another track I wouldn’t necessarily run, but I do regularly walk with the kids). It’s got a great surface which even during heavy rain is still firm underfoot with only minimal amounts of mud. The views are mostly native forest but there are sections with vast scenic views across the Manukau Harbor. Parking? – Yes, large carpark at the Arataki Visitor Center and enough parking for a few cars at the Exhibition Road end. Kid Friendly? Yes they can even ride their bikes as this is a shared path, however the section immediately after the look out is quite steep so if you have younger kids they may need to dismount on that particular section.